Check out Tobi's In Short Tunic Dress Far from basic, the In Short Vintage Tunic Dress upgrades the classic t-shirt dress. Featuring loose rolled up sleeves and a relaxed silhouette, this Vintage Black number will look like you tried hard (but you didn't, really). Wear this scoop neck shirt dress with white sneaks for an athleisure look to obsess over. Far from basic, the In Short Vintage Tunic Dress upgrades the classic t-shirt dress. Featuring loose rolled up sleeves and a relaxed silhouette, this Vintage Black number will look like you tried hard (but you didn't, really). 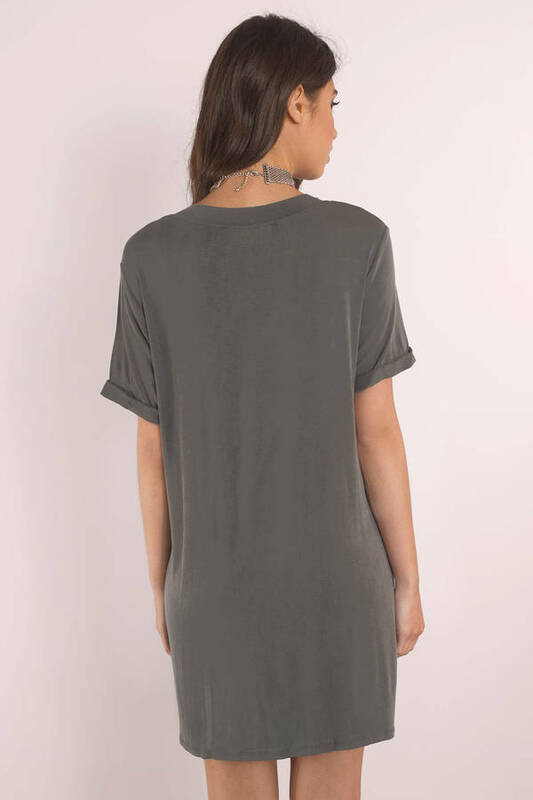 Wear this scoop neck shirt dress with white sneaks for an athleisure look to obsess over. Model's profile: height 5' 7", bust 33", waist 23", hips 33.5"
Model's profile: height 5' 7", bust 31", waist 23.5", hips 34"
Vintage Black modeled on a size Small. Model's profile: height 5'9", bust 32", waist 24", hips 35"